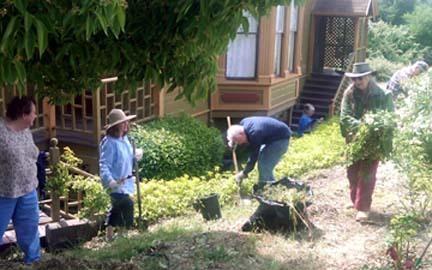 If you enjoy “digging in the dirt” the opportunity to enhance Vallejo through garden-related beautification and education, field trips, native plants, seed and plant swaps, and the company of other gardeners, then this club is for you! Our local club has been forming for some time and is now affiliated with the California Garden Club, Inc. (CGCI). Visit with our volunteers at the Vallejo Farmer's Market downtown, Saturdays from 9 a.m. to 1 p.m. on Georgia Street between Sonoma Boulevard and Sacramento Street. Volunteers are there to meet you on the second Saturday of each month. You also may learn more about the club at one of our open meetings held at the Heritage House at 419 Farragut Avenue in Vallejo. You also may see some of our other photos of our club at work or on trips via our Facebook page. Club members enjoy regular invitations to our monthly meetings, participation in special outings, photos and files we share online, and benefits related to our CGCI membership.